Senior leaders of CoinMaketCap, Crypto Facilities, Deribit, and a host of top-level crypto exchanges are among the event’s speakers. Ultimate Fintech and Finance Magnates continue to add to the growing list of thought leaders speaking at the first Barcelona Trading Conference (BTC) taking place on July 10-11, 2019. This Crypto event is expected to be the biggest specifically targeting the financial services industry, connecting more than 3,000 attendees drawn from among the most notable influencers and executives in the world of digital assets. BTC 2019 will host dozens of Crypto pioneers discussing key tokenization trends. The latest round of big names includes CoinMarketCap CTO Mauvis Ledford who will be running an in-depth workshop on portfolio visualization, Crypto Facilities Head of Indices and Pricing Sui Chung sitting in on a panel covering the outlook for institutional adoption, and Saga Foundation Founder and Foundation Council President Ido Sadeh Man participating in a session on stablecoins that is sure to be spirited. Previously announced panelists Swarm CEO and Co-Founder Philipp Pieper and Kraken VP are just a few of the innovators scheduled to share the stage with these distinguished speakers, presenting their ideas on stablecoins, and on what it will take to bring investments from big money managers, respectively. Finance Magnates is the leading repository for trading industry news and research, and has already earned a reputation for running the financial services industry’s premier events, including the London Summit, the iFX EXPO International and the iFX EXPO Asia conferences. 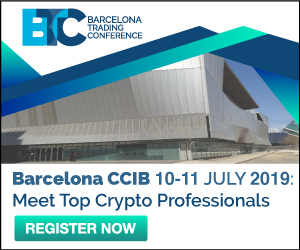 The Barcelona Trading Conference aims to bring the same level of professionalism to events dedicated to the Crypto ecosphere. There are still a limited number of sponsorship and exhibition opportunities available by contacting Finance Magnates at sales@btconf.io. For more information regarding Barcelona Trading Conference sessions and to register for tickets, visit www.btconf.io/2019. Previous Entry JP Morgan, Mitsubishi UFJ Financial Group – what bank will launch stablecoin next?